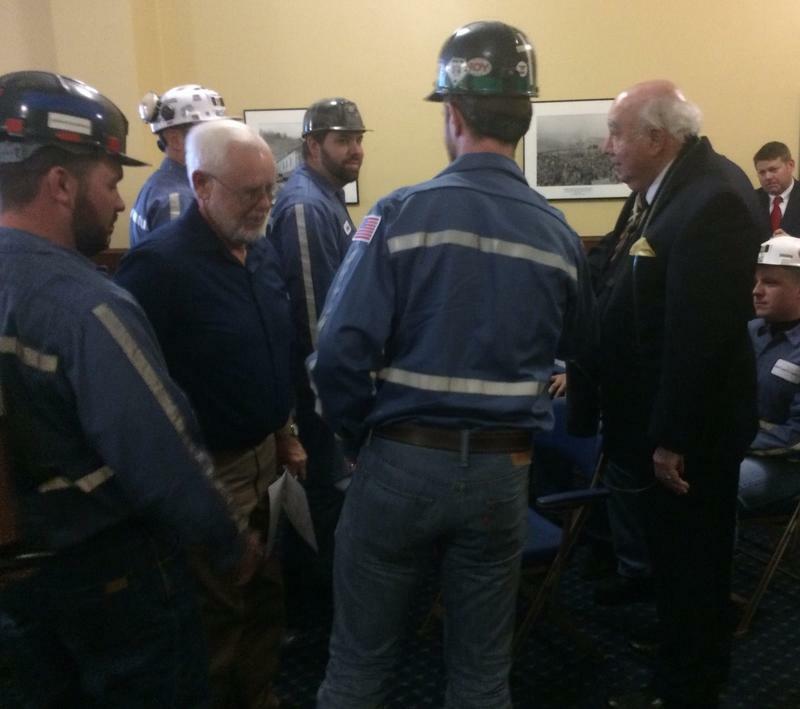 He campaigned on a promise to put miners back to work and his first year in office included numerous Ohio Valley visits to highlight coal’s importance. “I love our coal miners and they’re coming back strong!” Trump said to a roaring crowd at an Augustrally in Huntington, West Virginia. 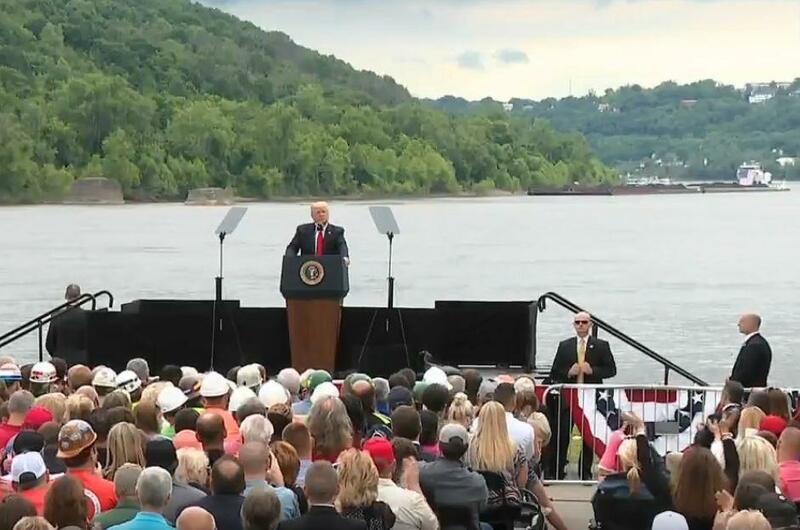 A coal barge passes as President Donald Trump speaks on the banks of the Ohio. And miners feature prominently in Trump ceremonies surrounding his efforts to undo Obama-era initiatives on clean power, climate change, and stream protections. One year into the Trump administration, some miners have returned to work in the Ohio Valley region. But the uptick in hiring and production is minor compared to historic levels and the heavy losses the industry has seen over decades. Miners and industry analysts see a mixed record in Trump’s first year and an uncertain future for the industry he has pledged to revive. 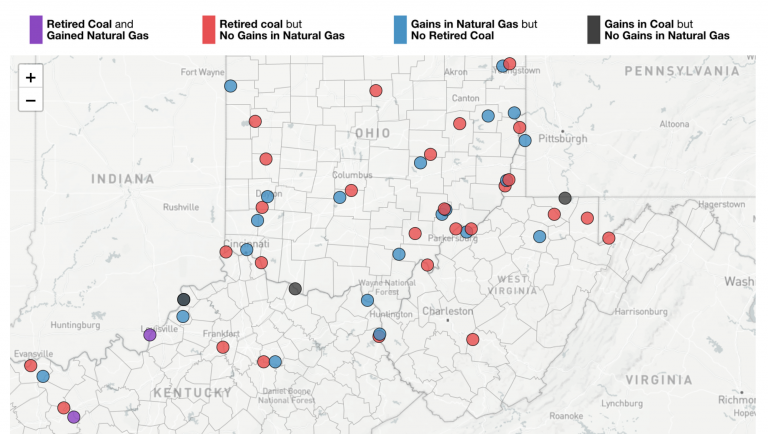 The regional view on the status of coal jobs and the coal market depends on which miners you talk to and what kind of coal you’re talking about. “I think Trump should be patted on the back because we need this coal,” said retired miner Noah Counts. Counts is from Clintwood, Virginia, and worked in few different mines in the state over a two-decade career. Roy Mullins is also from Clintwood and worked as a coal miner for about 41 years. He has a different opinion on how the first year of the Trump presidency has gone. “These promises that this fella’s in the White House doing right now, that’s a vote-getter and that’s it,” said retired miner Roy Mullins. Their contrasting views reflect the mixed record in coal employment during Trump’s first year. After years of decline there has been a recovery in coal production and employment, but it is uneven and not necessarily tied to anything Trump has done. 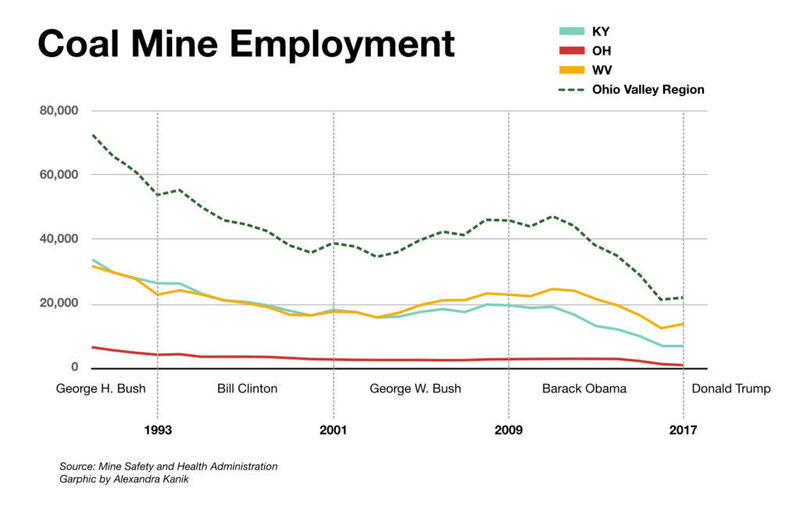 For example, West Virginia added more than a thousand coal jobs. But jobs were lost in Kentucky and Ohio. Overall the three states saw coal add just 745 employees in 2017. Industry analysts say the increase is largely due to temporary conditions in the global market. Marsters focuses on Chinese environmental and energy issues. U.S. coal exports to Asia increased in the last year partly because a cyclone knocked Australian coal out of the market. Marsters said that disruption in global supply — and not domestic regulation changes — explains the bump in US production. Marsters also co-authored a Rhodium Group report that examined the causes for coal’s decline over the past six years. It found that the rise of cheap natural gas as a competing fuel, improvements in energy efficiency, and growth in renewable energy were the greatest factors. Environmental regulations played a relatively small role, the report concluded, accounting for about 3 to 5 percent of the industry’s decline over the last several years. “You know, I think the administration largely overstates its impact on coal markets and its ability to decide their fate,” he said. Marsters says most increases have come for mines that produce what’s called metallurgical coal, used for making steel. But the vast majority of U.S. coal production is for what’s called “steam”, coal, the coal used to generate electricity. And there, the outlook for coal is still grim. 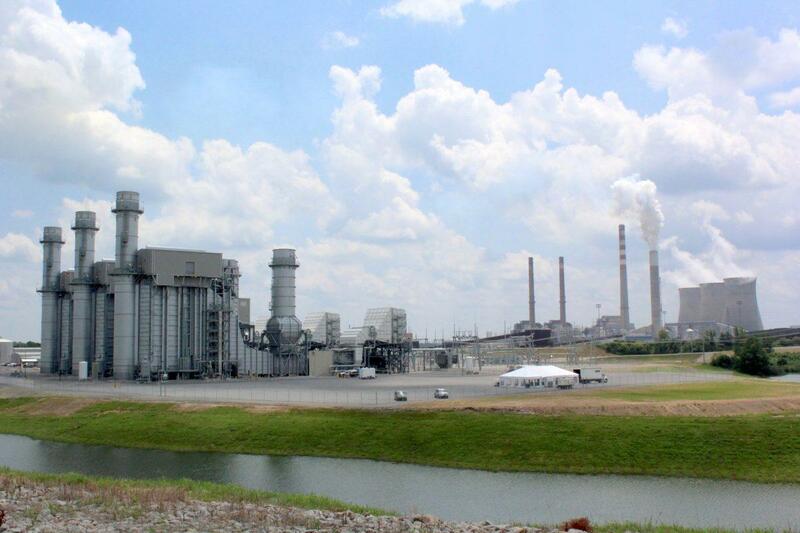 The Tennessee Valley Authority’s Paradise power plant in Kentucky is a prime example of the dominant market trend in electric utilities. In 2017, two of TVA’s three coal burning generators in Kentucky were retired in favor of natural gas. Sorrick was giving a tour of the new 1100 megawatt gas facility. In the distance stood the giant cooling towers of two older coal-fired generators, now idled. Armstrong coal operated the mines that supplied Paradise. In November Armstrong became the first coal company bankruptcy of the Trump presidency. 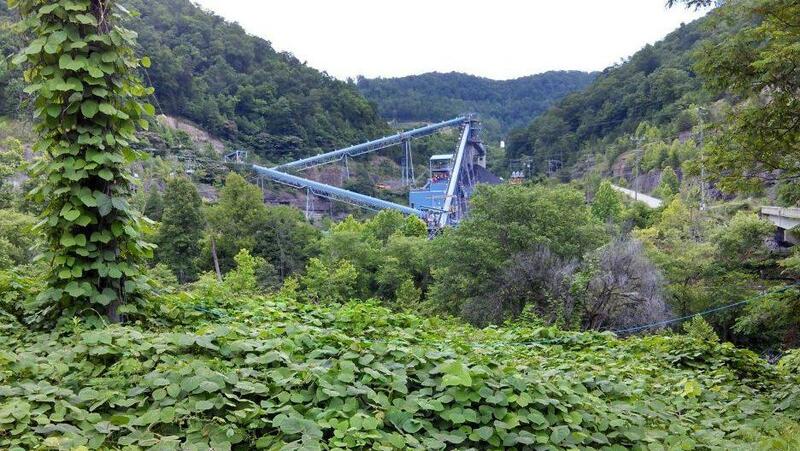 Illinois-based Knight Hawk coal is poised to take over Armstrong’s Kentucky mines. CEO Steve Carter said employment there will probably be lower. Carter said he doesn’t expect much to change in the coal markets in the next year. He’s glad to see the Trump administration working to roll back regulations. But he said most coal producers and power plants are already complying with environmental regulations. “I think President Trump is doing what he can, it’s just a difficult process,” he said. Brian Lego is a researcher at West Virginia University who recently co-authored a report about coal production in the state. He said although there’s been a slight spike in demand for coal in the Appalachian region, that is unlikely to continue. 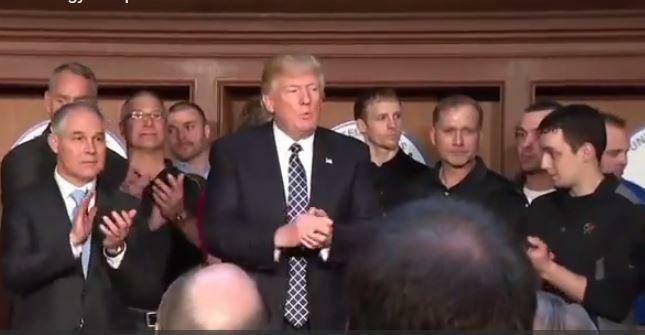 Coal miners flanked President Trump as he signed the executive order undoing the Clean Power Plan. 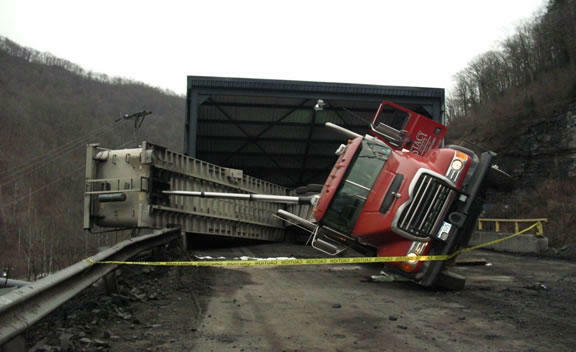 The Energy Information Administration predicts there will be a decline in U.S. coal exports and production. 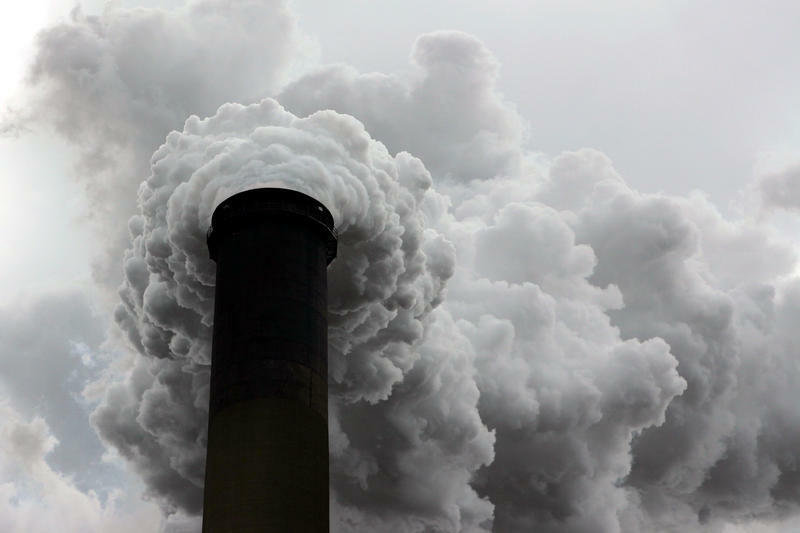 Lego said the Ohio Valley region will probably lose more coal fired power plants within the next couple of years. He said the increase in coal production has led to more jobs, but it’s probably temporary. 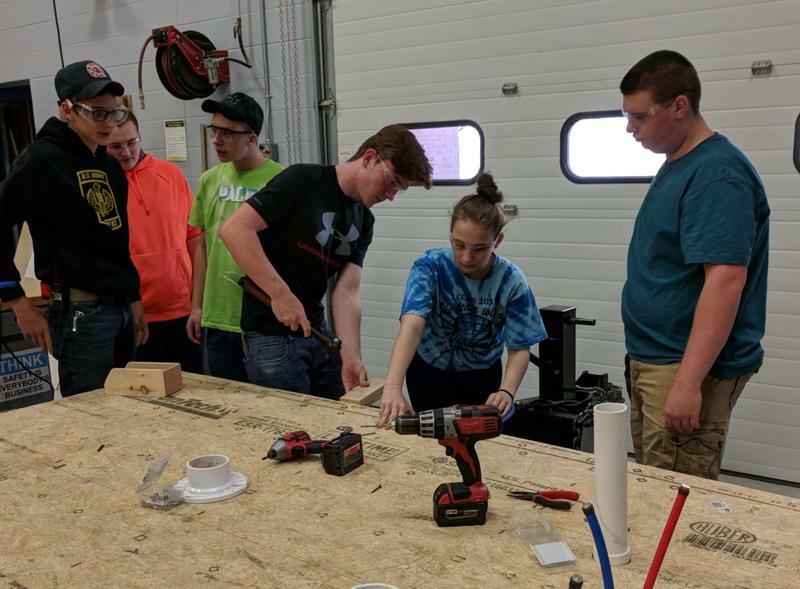 “Oftentimes when you see a bust from a boom it’s much worse because the places that experience the boom are ill equipped to deal with the bust,” he said. Which brings us back to miners Mullins and Counts. Mullins said he isn’t seeing the evidence of Trump bringing coal jobs back. “He knew that when he made all these promises to all these people and I think a lot of people are seeing now that they’ve been let down,” Mullins said. Counts said he has seen new mining equipment in his area, and if the companies are investing in their equipment then they’ll invest in the people. He’s holding out hope that Trump will improve coal markets and jobs. 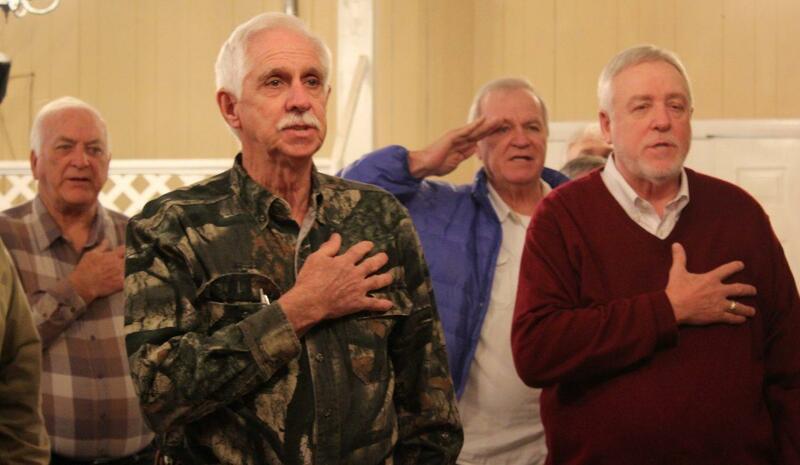 Retired miners begin a meeting with the pledge of allegiance. “Trump says it’s the last chance for the coal miner and I really believe that. I really believe it was our last chance, and it’s coming back,” Counts said. Both of these retired coal miners have been diagnosed with black lung, a disease that’s on the rise in Appalachian coal country. It’s a stark reminder that whatever the future holds for coal employment, coal miners will be paying the costs for years to come.